British man traveling in India indeed only lives once. That bucket list, mid-life “live it up” frivolous mentality that drives people to desperately don global travel as a spiritual salve is ridiculous. Traveling is overrated, and worn as an ostentatious badge of accomplishment, is dubious, exhausting and expensive. I have nothing against travel, per se, but the motivation behind it that many First Worlders enlist baffles me. I truly feel sad for Roger Stotesbury and his unfortunate end, but his death is illustrative of that void that drives modern man to flail for the sake of flailing while calling it “adventure.” And sometimes the most mundane predilections draw us deeper into the glum abyss. Did it need to be this way? A British man has died after falling from the second floor of an Indian temple. Roger Stotesbury was on the final leg of a “middle-aged gap year” trip with his wife when he fell about 30ft (nine metres) on Friday. 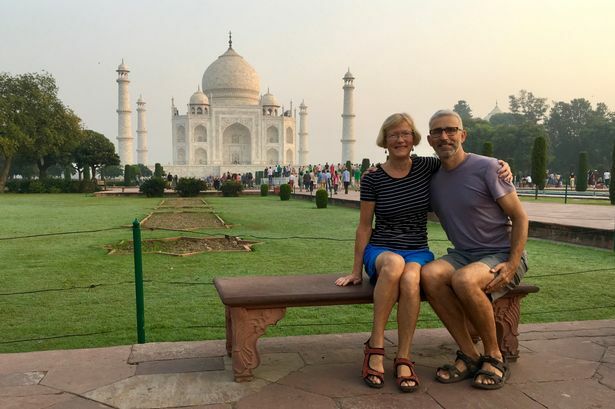 Local reports said Stotesbury, from Buckingham near Oxford, was trying to take a selfie at a temple in Orchha, about 160 miles south of the Taj Mahal. However, this has been disputed by his family, who said he had just finished taking some shots of the scenery and had put his iPad down on a ledge before the incident happened. The Times of India said he was “standing almost on the edge of a wall on the second floor of the temple” when he fell. Writing on their blog, Our Middle Aged Gap Year, the couple said they had decided to embark on the round-the-world trip because “you only live once”. Introducing themselves, they wrote: “We are Hilary and Roger, a married couple from England/Scotland who are in their mid fifties. Hilary’s motto is ‘just do it’ whilst Roger’s is ‘to die young as late as possible’. Sometimes “late” turns out to be earlier than you wanted and all the diversions in the world will not help ward off the lights of the train racing through the tunnel toward your dashing figure. “We took the view that on your deathbed you never wish you’d spent more time in the office,” the post continues. “We’ve seen our two kids off into the wider world and we have no more caring responsibilities for our parents. So we thought now is the time to take a gap year and travel whilst we still have the health and energy. After all you only live once. This seems to be the hollow mantra most bored toy adventurers repeat in order to justify the wanton search for “fulfillment,” whatever that word means. Sometimes your plans tragically pan out. Stay home. There are vast adventures in your mind if you only peer inward. Previous PostPrevious Who will carry Harvey Weinstein’s cross? Next PostNext Jimmy Kimmel, archetypal Leftist, selectively defines when his BS is…not.